The Nano 3.0 HD Media player by VonHaus will turn your HD TV into a home cinema. You will have the ability to play virtually any content directly from your hard drive or memory card via your HD TV. The HD Media player can read content from USB Flash Drives, External hard drives and the 3 in 1 card reader allows you to play content from SD, MMC and MS cards. The HDMI or Composite (AV) output means your media player is compatible with most TVs. If you're wanting to add to your HDTV experience and have media stored digitally then the Nano 3.0 HD Media player is a must have! You will be able to watch HD films without the need for a blu ray player, watch picture slideshows and any other media you have stored, which will mean a truly fantastic experience with your TV. With support for a number of codecs, you can be sure the Nano HD Media player will play almost any content you may have, and the compact size means it won't take up much space at all! Reads hard drives formatted in FAT32 and NTFS, supports hard drives up to 2TB and SD/MS cards up to 64GB. Also plays subtitle files as well as loop videos. Unbox the contents and plug in the device with the mains adaptor and either a composite AV cable (supplied)or a HDMI cable (supplied). Power on the device and find your TV's correct AV channel. If the device does not connect, press either the HDMI button or the AV button on the Media Player's remote and this should now be connected. Enjoy all your stored media. Note: Dimensions of the VonHaus Media Player are 3 x 2.75 x 0.5 inches. Download media (videos, music, etc) from the internet, save it to USB drive/memory card/HDD then play it through your HD TV! Supports hard drives up to 2TB and SD/MS cards up to 64GB. 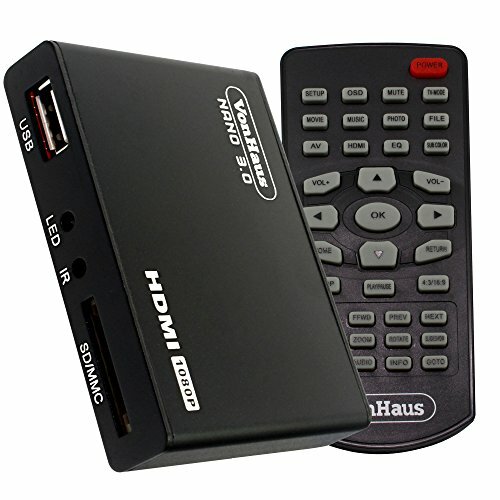 A great product for ultimate in-house entertainment - IMPROVED MODEL REMOTE CONTROL included! If you have any questions about this product by VonHaus, contact us by completing and submitting the form below. If you are looking for a specif part number, please include it with your message.